Home Sellers Choose Will Vasana to List and Market Their Homes. When potential buyers look at property, small details can make strong first impressions. There's only one chance for a good first impression. You might like to try some of these ideas while preparing a house for the best first impression possible. 1. Safety First: Remove items that could cause visitors to stumble, trip, or become injured in any way. Inspect the house from top to bottom. Correct any potential hazard. Check carpeting and floor covering; tighten loose stair treads and handrails. This protects the owners and the guests. 2. 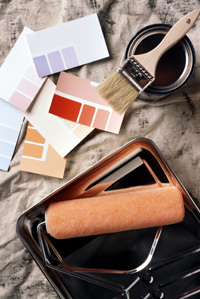 Fix-up: Small repairs could make the difference between a house that is appealing and one that has to be sold. It is easier to show how beautiful a home is, than to ask buyers to imagine how it could look after simple repairs are made. A small amount of time and money invested in sprucing-up can pay off. A loose door knob or leaky faucet can make potential buyers wonder about other repairs, and cause them to look harder for problems. You can try to tell a buyer how easy and inexpensive a repair will be (and hope they believe you), or you can repair it to prevent disillusionment that could impede a sale. 3. Clean-up: How does the driveway look? First impressions start with curb-appeal and continue as the prospects walk to the house. Keep the lawn cut and edged, leaves raked, shrubs trimmed, and garage arranged neatly. Of course, spring cleaning inside and out, is one of the first steps in preparing a house for sale. Check everywhere for odors, and remember to change the air conditioning filter often. 4. Touch-up: A freshly painted front door and touch-ups around screen doors and windows add eye-appeal. 5. Light and Sound: Bright cheerful lighting creates a positive environment when potential buyers look at a house. Replace burned out light bulbs. During showings: turn on lights, open drapes, blinds and shades to reveal sparkling clean windows. Reduce noise levels. Turn off the TV, dishwasher, washer, and dryer. Add soft music. 6. Kitchens and Bathrooms are very important: A bit of extra scrubbing and caulking here, can go a long way to help a sale. Potential buyers judge how the entire house is maintained, by the condition of the bathrooms and kitchen. A bowl of fruit in the kitchen, or a plant in a bathroom, is a nice touch. 7. Inspections: Consider a Home Inspection now, to prepare for a smoother closing when a sale is underway. 8. Furniture: Thin out furnishings to expand pathways and create more open space. This gives the rooms a feeling of more size. It is a good idea to delay any discussion with lookers about selling your furniture or other personal possessions, until after they are sold on the house. 9. Closets: Plan to tidy closets, store or dispose of unwanted items, before showing the house. Is it time for a Garage Sale? Neat closets seem larger. Here is a decorator's tip: fresh white paint inside of an almost empty foyer closet creates another good impression. 10. Breakables & Valuables: These should be stored temporarily in a bank, or maybe with family. 11. Pets: Animals should be away from the premises during appointments and Open House (maybe with a neighbor), or at least safely confined. People who avoid dogs, cats or other pets, may not react well to them. 12. Appointments: Have a Guest List ready for prospects to write their names, addresses and phone numbers, as they enter the house. With this information, follow-up phone calls can be made, to invite prospective buyers to take a second look. For more tips on preparing your home for sale, call or e-mail me. What is your home worth in today's market? I will furnish you with a FREE Comparative Market Analysis on your home! No obligation, of course. Please complete the following information which will be used to prepare a report detailing all current real estate listings and recent sales activity in your neighborhood.